Have a merry, Siri Christmas with the best movies, games, yule logs, and more. Christmas is almost here. With it come smiles, laughs, presents, and memories. 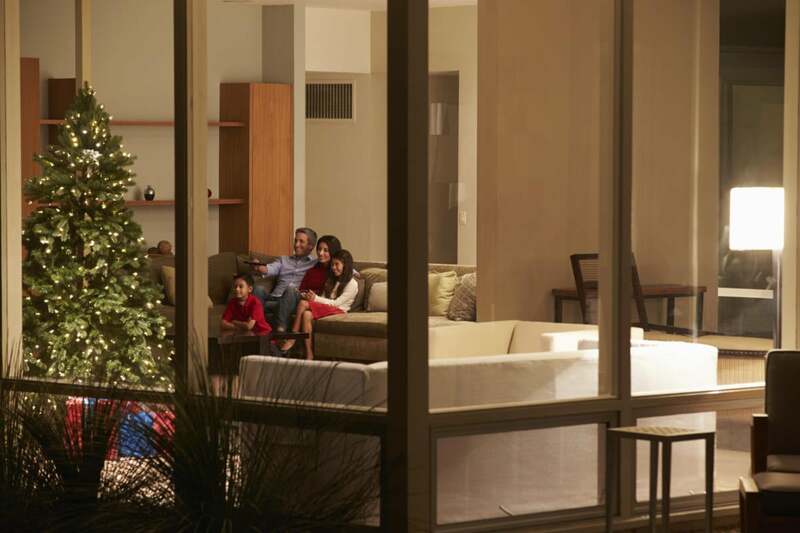 Traditions, of course, are part of the routine over the holidays—but as technology becomes more present in our lives, our traditions tend to change. Now that the fourth-generation Apple TV has been available for over a year, and the OS itself has received a fairly significant upgrade, with Siri getting smarter, and a dedicated TV app for suggesting shows, here are just a few of the ways you can make the Apple TV part of your new family traditions. First thing’s first, before diving into the TV app and trying to find a classic Christmas flick, make sure you have Single Sign-on set up. On your Apple TV open Settings > Accounts > TV Provider. Sign into your cable provider, if you have one. Doing so will allow you to get the most out of the new TV app. Of course, you’ll also want to download any network apps you use to stream your favorite shows and grant each app access to your SSO info when prompted. With SSO set up, the TV app will start recommending shows you might like. 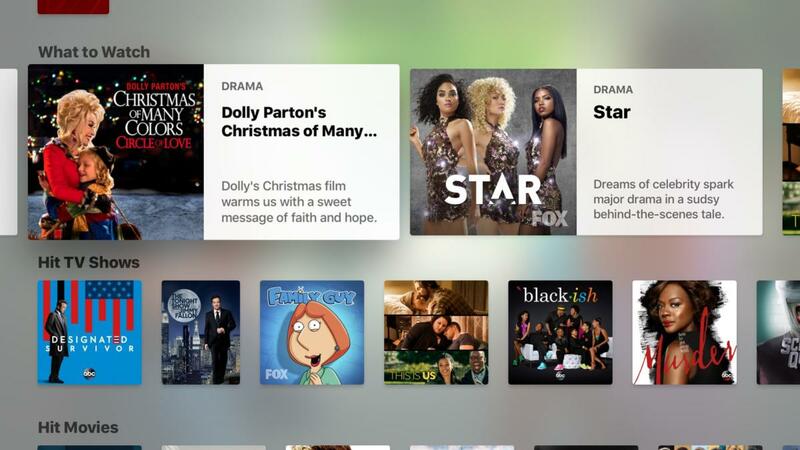 So if you’ve been watching a lot of Christmas or holiday themed shows on Hulu or in a network app, the TV app will take that into account and suggest something similar you may like, but have yet to watch. If you’re having trouble with the TV app, you can always use Siri to search for holiday classics such as White Christmas or Scrooged on Netflix, or browse Hulu’s New Holiday Specials and Episodes section, full of Saturday Night Live skits and similar specials from TV shows. If you’d rather have the sound of Christmas fill the air, Apple Music has list of holiday playlists. 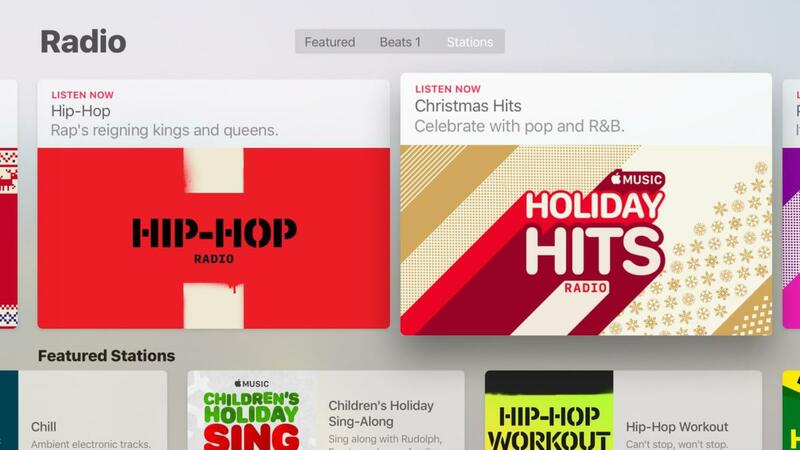 Personally, I like the Holiday Pop Hits, Sentimental Christmas, and Children’s Holiday Sing Along radio station (Apple Music > Radio > Stations). If you don’t have an Apple Music subscription, you can always download the Pandora app and use it, or download an app called Christmas Radio for free in the App Store. Speaking of Netflix and Hulu, instead of paying for an app that mimics a fireplace in the App Store, both streaming services offer videos of a fireplace burning, cracking, and popping away. 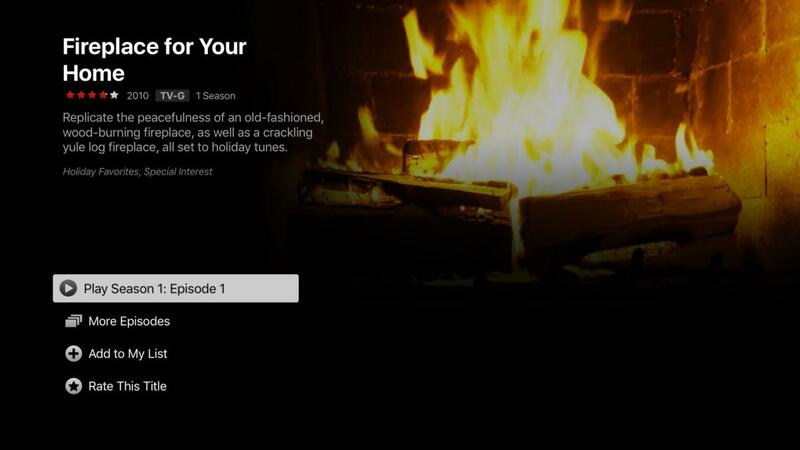 Search Hulu for “Christmas Fireplace,” or Netflix for “Fireplace For Your Home.” And if you don’t have either, just pop open YouTube and do a search—“Nick Offerman’s Yule Log” is one of our favorites. For someone who doesn’t have a fireplace, a virtual log burning is better than nothing, right? The most memorable parts of Christmas for a child usually involve Santa Claus and his whereabouts on Christmas Eve. Two apps in the tvOS App Store make it fun to track Santa, as well as give parents a tool to get kids back on the right track if they start getting a little too carried away. 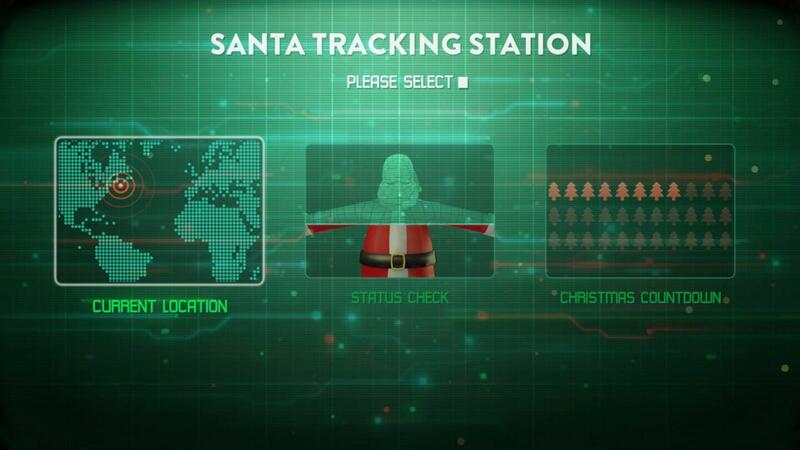 Santa Tracker is free and has three different sections. First is a map you can use to view where Santa is at a given moment. Second is a status check, dishing out stats such as number of Ho-Ho-Ho’s exclaimed and letters received. Lastly is a Christmas countdown, with each second ringing a bell. It will get annoying, so I suggest muting your TV. Santa Hotline puts a Santa a button press away, be it on your TV or iOS device. Open the app and tap the button, Santa will answer a few seconds later, waiting to hear just how naughty your kids have been. Cruel? Perhaps. Parents are tasked with keeping kids inline, who are under the spell of excitement of receiving presents and the magic of Santa and we need all the help we can get. 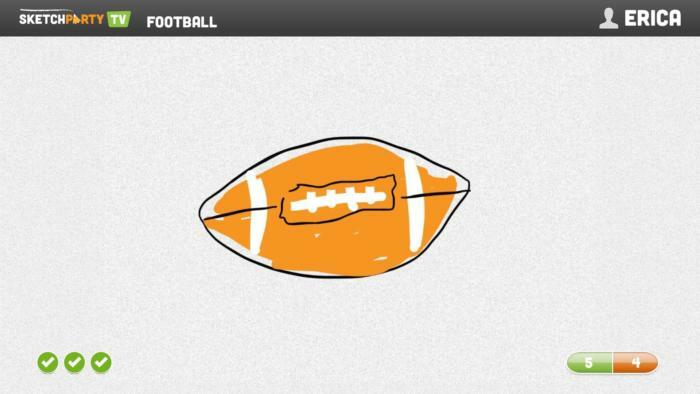 It’s a digital, modern version of Pictionary and is easy for all ages to get into.